Police officers and firefighters are entitled to their disability coverage. We help you understand and claim your benefits. Disability benefits are available to Ohio Police and Fire Pension Fund members who can no longer perform their official police or fire duties due to a disabling condition, either physical or mental, or a combination of disabling conditions. The disabling condition does not have to be job-related, but it must be permanent, lasting 12 months or longer. Chapter 742 of the Ohio Revised Code sets forth the law governing the Ohio Police & Fire Pension Fund (“Police & Fire”). To be eligible, you must have made contributions to the Police & Fire fund within one (1) year from the date of your application filing. If you are no longer actively contributing to the Police & Fire fund, then you must have kept your contributions on deposit and you must file the disability application within one (1) year from the date you are placed on administrative leave or terminate your employment. This one-year date starts from the last date that you last earned regular salary, compensation, or earnings by either working or using accumulated time to remain on normal payroll status. If your application is not filed within this one-year requirement, then the OP&F will deny your application. You may continue to work while pursuing disability retirement and filing your disability retirement application. Statutory Presumption. Under Ohio Revised Code 742.38(D)(3), Police & Fire presumes that certain types of disabilities are “duty-related.” For instance, cardiovascular, chronic respiratory, and heart diseases are presumed to have occurred in the course of your employment as a police officer or firefighter. Cancer incurred by Firefighters after 6 years of hazardous exposure is also presumed to be duty-related. When filing disability retirement application: you must file your pre-employment physical with your application with Police & Fire and the report of your pre-employment physical confirms that your condition did not exist at the time you became a Police & Fire member; and there is no other competent evidence that shows the disease was not incurred in the line of duty. Average annual salary is calculated by taking the average of the three (3) or five (5) highest years of salary, earnings, or compensation, regardless of when in your career the highest years occurred, but is subject to certain statutory and administrative limitations. Accordingly, not all salary, earnings, or compensation may necessarily be used in the calculation. The calculation of the average annual salary is used for all calculations of disability granted by Police & Fire. If you have less than fifteen (15) years of service credits as of July 1, 2013, then your average annual salary is calculated by your five (5) highest years of salary. If you have fewer than 25 years of service credit, the annual benefit payable under a partial disability grant is set by the Police & Fire Board of Trustees to be a certain percentage of your “average annual salary.” The maximum percentage the Board can award someone with fewer than 25 years of service is 60 percent. If you have 25 or more years of service credit, then the Board of Trustees determines your partial disability. The amount of your annual benefit, however, is set by law to be equal to your normal service retirement pension, but cannot exceed 72 percent of your “average annual salary.” The way to determine the annual benefit is to multiply the average annual salary by a percentage equal to 60 percent plus 1.5 percent for each year of service from 26 to 33. For instance, 28 years equals a 64.5 percent award (60 percent for the first 25 years, plus 4.5 percent for 3 additional years at 1.5 percent for each of those 3 additional years). According to Ohio Revised Code 742.38(D)(4), if your disability is not job-related, and you are an eligible OP&F member, you may qualify for an off-duty disability retirement benefit. To be eligible, you must have at least five (5) years of service credit. You can purchase or restore credit in order to meet the five-year requirement. To be eligible for an off-duty disability retirement, the disability must prevent you from performing your official duties and impair your earning capacity. The Police & Fire Board of Trustees sets the annual benefit to be a certain percentage of your “average annual salary” but, according to Ohio Revised Code 742.39(C), cannot exceed 60 percent. Pre-employment physical or a letter stating it is not available. The Disability Evaluation Panel consists of the Board’s Disability Committee and expert physicians, and vocational evaluators. It meets once a month to review applications for disability benefits, and to prepare written recommendations for action by the full Board of Trustees. If the Board of Trustees denies your application for benefits, or if you disagree with the grant awarded at the initial determination hearing, you may file a written notice of appeal within the appeal period. Ohio Administrative Code 742-3-05(E) sets forth the appeal process. The Board of Trustees meets once a month with its medical advisor and vocational expert to hear appeals. Ohio Administrative Code 742-3-05(F) provides a process allowing a member who is receiving less than the maximum partial or off-duty disability to request reconsideration if he or she believes that the disability has worsened. If you are already receiving either less than the “maximum” partial disability benefit based on fewer than 25 years of service credit, or less than the “maximum off-duty” benefit, and your earning capacity becomes further impaired or eliminated due to a deterioration of the disabling condition(s) for which you were placed on retirement, then you can apply to have the Board of Trustees review the partial disability grant. Such a review may result in an increase or decrease in monthly benefits. However, Police & Fire cannot reconsider your grant for conditions not covered by the disabling condition originally listed. Once the Ohio Police & Fire Pension Fund approves your disability application, OP&F will calculate your monthly benefit. Below is a summary of how the Police and Fire Pension Fund will calculate your benefit and the credits you may receive. The Ohio Police & Fire Pension Fund will calculate your disability retirement benefit using the Cost-of-Living Adjustment (COLA) method, unless you chose to have it calculated under the Non-COLA method. You may choose the Non-COLA method only if you had at least 15 years of service credit as of January 1, 1989. Under the COLA method, Ohio law requires OP&F to pay annual COLA’s to eligible members. OP&F members who have 15 or more years of service credits as of July 1, 2013 and who are not receiving a benefit from OP&F and members who are receiving a benefit that became effective before July 1, 2013 will receive a COLA once they have received benefits for at least one year and have attained age 55. OP&F calculates your disability benefit by using the average of your three (3) or five (5) highest years of salary, compensation and earnings (but not including any terminal pay such as unused sick leave, vacation, personal leave, etc. ), and multiplying that amount by the relevant percentage. Under this method, OP&F awards you a cost-of-living increase equal to 3 percent of your base pension benefit on the anniversary of your retirement date each year. If you had at least 15 years of service credit as of January 1, 1989, and elected the Non-COLA method, OP&F calculates your disability benefit by using your average annual salary, including any allowable terminal pay, and multiplying that amount by the relevant percentage, subject to certain statutory and administrative limitations. Since the salary used for pension calculation purposes is higher than the COLA calculation, the Non-COLA method provides for no cost-of-living increases to your benefits. qualifying for grants of service credit. The bulk of your credit is earned by working as a full-time police officer or firefighter with a qualifying employer in the State of Ohio and making contributions to OP&F. OP&F does not accept contributions for volunteer or part-time service, nor does OP&F grant credit for periods of service which were canceled due to a refund of contributions unless a restoration of the withdrawn contributions plus interest occurs. In addition, you cannot earn OP&F service credit while also earning service credit in another retirement system during the same time period. State Highway Patrol Retirement System. In addition, you may purchase service credit for time served in active military duty, active military duty for training, initial active military duty for training, inactive military duty training, full-time national guard duty, and for time you are absent for an examination to determine your fitness to perform military duty, provided you were honorably discharged and the appropriate paperwork is filed with OP&F supporting your service. There are certain conditions and limitations. Also, you may purchase credit for time during which you were a prisoner of war. The Ohio Police & Fire Disability Pension Fund retains continuing jurisdiction to modify disability determinations. After the initial disability grant, subsequent circumstances may warrant a modification or termination of benefits. When you are awarded disability benefits, OP&F has found you to be unable to work as police officer or firefighter or any type of similar employment. 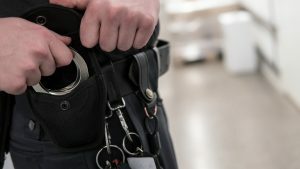 Under Ohio Revised Code 742.40(C), if you are receiving disability benefits, OP&F may terminate your benefits if one of their physicians certifies you as having recovered, or if you return to work as a police officer or firefighter. By September 1st of each year, you must submit an annual earnings statement (AES) to OP&F, reporting your earned income for the previous calendar year. If you are required to complete this form, OP&F will mail this annually to you. If you do not comply with this requirement, your disability benefit will be suspended. OP&F may waive this AES requirement if an OP&F-appointed physician has certified your disability as ongoing and your disability conditions meet the policy established by OP&F’s Board. Also, OP&F is required conduct an annual medical evaluation of any member who would not have been eligible for a normal service retirement pension at the end of the reporting year. Police & Fire’s Board of Trustees may waive these requirements if their physician has certified your disability is ongoing and that the disabling conditions meet the policy established by the Board of Trustees. If you are receiving disability benefits, OP&F may reduce or terminate your benefits if you have experienced an improvement in your earning capacity. If OP&F terminates your disability benefits, you may still receive a retirement pension if you had sufficient service credits at retirement, and if you satisfy all other conditions for service retirement. If you have recovered and are able to return to your official police or fire duties, or you become employed as a police officer or firefighter, your disability benefits will end. If Police & Fire terminates your disability benefits, you may still receive a retirement pension if you had sufficient service credits at retirement, and if you satisfy all other conditions for service retirement. Under Ohio Revised Code 742.40(C)(1), OP&F considers you to be on a “leave of absence” during the first five (5) years after you have resigned to receive a disability retirement benefit. If you recover and your disability benefits are terminated during this five-year time period, your employer at the time of your disability award, at your request, must reinstate you, subject to certain restrictions. If mutually agreeable to both you and a OP&F covered employer, you could be reinstated at any time. In either event, your disability benefit terminates, your active membership is reestablished with OP&F, you are given a service credit equal to the period of compensated disability, and your contributions are reduced by the total amount of disability benefits paid to you. Your effective date of retirement is the day following the last day for which you earned compensation by working or used accumulated time to remain on active payroll status. However, if you fail to terminate employment within the time period prescribed by OP&F, your disability grant will be rescinded and no longer effective. Once you file an election to accept the disability benefit granted, OP&F sends a short form to your employer, requesting verification of your termination and separation pay information. About three (3) weeks from the date OP&F receives the completed short from and all other required information from your employer, Police & Fire will calculate your benefit and begin paying you an estimated amount. Up to one year after retirement, you should receive your exact benefit with any adjustments made to reflect any over or underpayments of interim benefits.